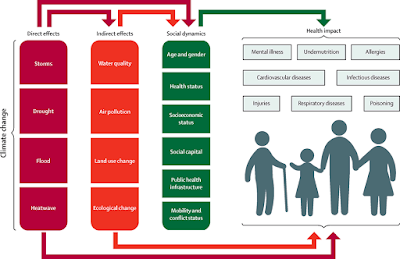 Figure 2 The direct and indirect effects of climate change on health and wellbeing There are complex interactions between both causes and effects. Ecological processes, such as impacts on biodiversity and changes in disease vectors, and social dynamics, can amplify these risks. Social responses also ameliorate some risks through adaptive actions. However, the report provides comprehensive new evidence showing that because responses to mitigate and adapt to climate change have direct and indirect health benefits -- from reducing air pollution to improving diet -- concerted global efforts to tackle climate change actually represent one of the greatest opportunities to improve global health this century. 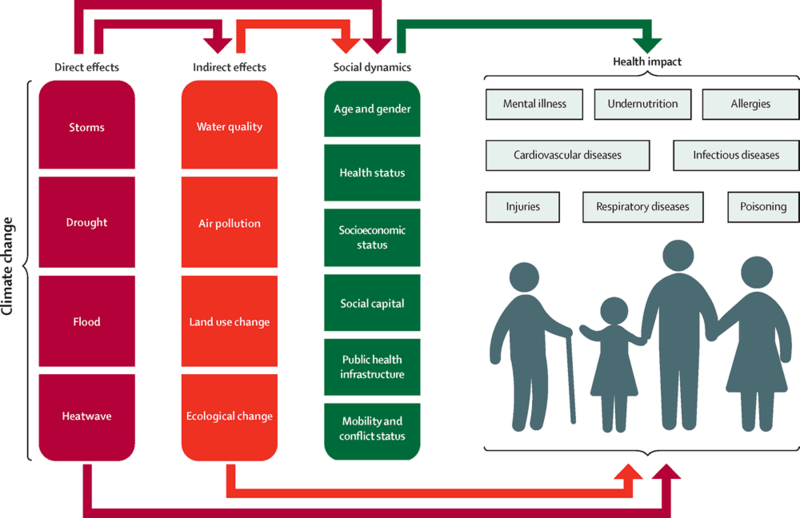 The potentially catastrophic risk to human health posed by climate change has been underestimated, say the authors, and while the technologies and finance required to address the problem can be made available, global political will to implement them is lacking. You can read the full press release at ScienceDaily.com and the paper at The Lancet. It's open source, but you'll have to register to read it. The report has good news and bad. The good news is that if we address climate change by cutting CO2 emissions and moving to clean energy sources, then human health will improve. If we don't, then human health will suffer. Yes, we all know all that. It's good that health professionals are getting on board and figuring out how health will be affected and what can be done about it. LarryFine is stuck for words, too. Steve Lohr is another with a knee-jerk reaction. I don't think anyone at WUWT took the time to read the paper or consider that it has merit. Deniers huddle close to each other for comfort, knowing there are other people somewhere out there in cyberspace who think that all the world's scientists are "wrong". RiHo08 jumps from one food fad to another, and probably knows as much about climate science as he or she does about nutrition - zilch. Dixon is driven by emotion rather than reason, which is a feature of climate science deniers. M Seward is getting a bit overwhelmed by all the talk about climate change - and I think meant Paris, not Apris.
" *sigh* and another one bites the dust. Lancet was once a high quality journal." Another major journal added to the vast list of institutions and scientists comprising the conspiracy to trick her(?). It never occurs to deniers that there might be the tiniest thing wrong with the notion that the whole rational world keeps lining up against them. The WUWT article and comments are equally appalling. But I do wonder if the majority of people in the western world are any better. Because even if they accept the science, they continue to live their planet destroying slob lifestyles in the knowledge that they are participating in ecocide. There's been some amusing sniping at Lief Svalgaard on WUWT re sunspots. I've weighed in and defended him. Apparently it's OK to alter historical SS records ... well according to some (AW included). BTW: I'm not 100% but I've been getting a lot of adware/redirection type viruses lately and the only place I've been to more often is WUWT. I knew it was a bad habit - but it is such a source of fun. Sou, *that* comment has been snipped now at WUWT. Good. It took a day or more plus multiple complaints. Still, better late than never. Would have been better still if it had never been there in the first place. "I woke up to very much the same carp!! And wrote this as a response:"
Oh really now? If you think that's something to carp about, you should visit the thread just below this one, where they're trouting out all kinds of nonsense. For the birds, they are. "Corn" merely means the dominant grain crop - so in England, "corn" before (and after 1490's) usually referred to wheat, but oats in Scotland. Its use to refer to maize probably came about because maize was the dominant grain crop in the Americas. The British "Corn Laws" regulated any grain crop, showing that the definition of corn to mean other cereals than maize was current in the 19th century. To avoid ambiguity, "maize" should be used instead of "corn," assuming that is the cereal crop meant. MSW, it's great to see someone after my own pedantic heart! It helps to know that "corn" derives from linguistic roots for "seed" or "grain", and it is in this sense that I always try to read it, except in obviously American contexts. It's all just grass seed, folks! It's not always easy to remember that. I think we're all scarred Bill. For me it started young with Enid Blyton and then later with British traditional folk songs. My granddaughter calls sweetcorn yellow peas, thus opening a whole new area for confusion. ah yes....bought to you by the same people who 'discovered' the MMR/Autism link. And wasn't that a boon for child-kind? Still, it's saying the things we want to hear so let's all, as usual, accept it as Gospel. If anything, you could blame the peer review process for failing to spot the problems in Wakefield's original Lancet paper. But that's hardly the fault of the Lancet, as Wakefield wasn't being honest. It was largely through the tireless efforts of investigative journalist Brian Deer that the whole sordid tale was eventually unravelled. metzomagic, good response. Let us not forget that Deer found real, verifiable evidence of Wakefield's dishonesty, with a paper trail that made him look very guilty indeed. Let us not also forget the climate change denier journalists who made a whole mountain out of a couple of comments in 5000 emails. If climate change was a fraud, why haven't all those journalists who claim to be looking found a smoking gun? Can't be doing their jobs well. Yes. And the same people who diss the Lancet for one or two bad papers out of thousands top quality papers over decades, and ignore all the medical advances published there that have probably saved countless lives, will not bat an eye while their favourite denier blogs makes one wacky and wildly wrong claim after another, several times a day - with no consistency and not a scrap of science to back them up. Perhaps Alan is trying to be ironic. Its the Wakefields of climate science that the fanboys over at WUWT worship. The papers the Wutters accept (and which don't get Anthony's 'claim' treatment) are frequently debunked within days of publishing. Editors have resigned over some of them. "... for failing to spot the problems in Wakefield's original Lancet paper. " What problems were there in the paper? From what I remember it was a fairly straightforward description of something he did. That is, analyse DNA samples from the bowel from children with autism and who had the MMR vaccine(?) and detecting vaccine DNA. Publishing the paper may have been part of a bigger problem but I do not think there were any specific issues with the paper. Willing to be corrected if I am wrong. The disease test results reported in the paper were falsified and changed from their actual findings during the clinical trials. It is not the method in question (setting aside the pediatric ethics violations), it is that the paper was simply fraudulent. The best place to go to for the true jaw dropping story of Wakefield's fraudulent paper is Brian Deer's own site. He did brilliant research to uncover the sorry saga. Ironically, he also uncovered wrongdoings by the pharmaceutical industry yet still gets called a pharma shill. To add to Alexander's comment and rebut metzomagic's comment, the peer review process could not have found the problems in the paper, because the problems were in the falsified records. In addition, Wakefield significantly overinflated the results of the paper in press releases and interviews. Add the Conflict of Interest of Wakefield himself and of the recruited patients (read: their parents), and you have loads of problems that amount to wholesale fraudulent research that no peer review will be able to detect. I had a look at the Deer report and it is not the same paper I remember reading (several years ago). However I think the point I was making is, as Marco says, that peer review would not have been easily able to pick up the problems. So that is not the issue.